It happens all the time. You know without a doubt that it’s time for a change in your profession or career. You start exploring options, trying to find that ideal path that will provide job security, good pay, and be something you enjoy doing. And eventually, you find it. But then something happens that causes the whole thing to stall and prevent you from going “all in.” It might be uncertainty about if it’s really the best path ahead for you. Or concerns about the training involved, how much it will cost, or finding the time to complete it. Once you’ve done the research and found that great new career, taking that last step toward actually making it happen can be a scary one. But when it comes to really creating new opportunities for yourself, it’s necessary. Take, for example, the field of welding. While being a welder offers a number of attractive benefits, some who start down that path don’t finish the journey and take advantage of those opportunities. And often it’s because of myths about the field of welding that are anything but true. So here are five myths about being a welder, and our reality check busting them, so you won’t find yourself missing out on a great career. This is a common one. For some reason, a false image of welders earning low wages has persisted over a long period of time, but in reality this couldn’t be further from the truth. According to O*Net Online, the median annual wages for welders, cutters, solderers, and brazers nationwide is $39,390. And in Pennsylvania, O*Net reports the median annual wages for welders, cutters, solderers, and brazers is even higher, at $39,690. Welders often see their wages increase as they gain experience over time, and the option of opening your own shop can also create opportunities for more pay. This is another one that has persisted over time and is equally off base. Welding is a trade that is constantly evolving with advances in technology that require welders to stay on top of training. 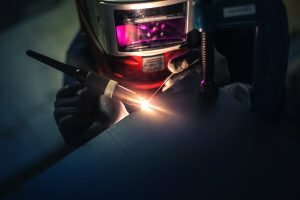 Welders need to learn and be trained on new techniques, and using new equipment, to adhere to elevated industry standards. Advances in materials to improve fuel efficiency require welders to be adaptable and consistently enhance their knowledge and skills. One of the big trends in the welding profession that has been happening over the past several years is the significant uptick in the number of women entering the field. According to the U.S. Department of Labor, Bureau of Labor Statistics, in 2014 women made up 4.8 percent of all welding professionals across the country, a figure that represents a solid increase over previous years. Manufacturers of all types are on the lookout for skilled welders, and women will likely continue to be a dependable source to fill that employment gap. Wrong. There’s no denying the fact that employers will continue to need trained welders into the foreseeable future. According to the American Welding Society, the U.S. will be faced with a shortage of more than 400,000 professional welders by 2025. And according to O*Net Online, Pennsylvania will see a projected growth in the need for welders by 6 percent between 2014 and 2024. But what’s often overlooked is the fact that welding is one of the few trades that can be applied across a huge spectrum of industrial and manufacturer settings—from automotive and bike shops, to construction, to nuclear power plants and oil rigs. Without question, the opportunities out there for skilled, well-trained welders are huge. The big difference between you and others who are thinking about pursuing a career could be this—taking that final step toward making it happen. Penn Commercial Business/Technical School has been a leading provider of trade education and training programs for decades, helping individuals like you cross that finish line and embark on empowering new careers. You can complete the Welding Technology program at Penn Commercial in just 12 months and be on your way to take advantage of the many employment opportunities in Pennsylvania and beyond. You’ll benefit from extensive hands-on training, using the same kind of equipment and technology that you’ll work with in real-world job settings. Penn Commercial has been educating students at its facility in Washington County for more than 85 years. Now could be your moment. You’ve done the research, you know it’s time to take your career in an exciting new direction, and you can see the huge opportunities and solid income potential that a career in welding could provide. At Penn Commercial, we help individuals like you go all in and make it happen every day.